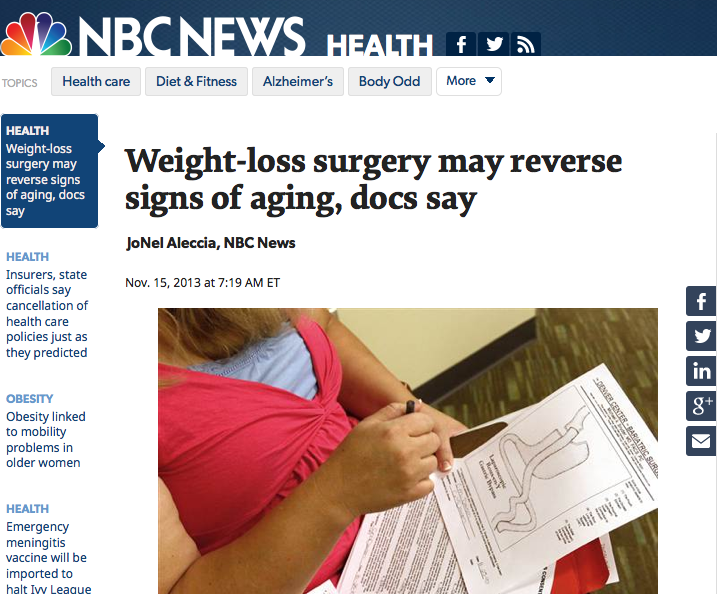 Blog Weight loss surgery makes you younger- but how? Researchers are finding that surgeries that produce dramatic weight loss were also associated with a 3% increase in telomere length, which normally decreases as we age. What could be the possible mechanism of this? When the entire environment improves by reducing the number of old and dysfunctional fat cells, the remaining cells are in a happier environment with less insulin, hyperglycemia, oxidation and glycation (which is a toxic environment for all cells to be bathing in). From the American Diabetes Association comes is an example of medicine proving what should be obvious if you understand my unified theory of aging: that Aging is simply the accumulated damage in stem cells from telomere shortening.